Canada could eliminate Poverty and Homelessness overnight. But will they? This article was originally published at the NAAIJ on Nov. 11th 2013. Every so often the overwhelmingly sensible notion of a Guaranteed Basic Income arises, Historically known as ‘Mincome’ in Canada. This sudden outbreak of common sense comes, shockingly, from a Conservative, Senator Hugh Segal. 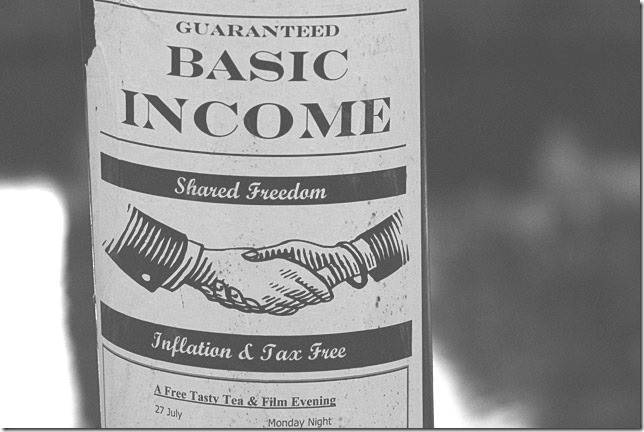 What is a ‘basic income’ you ask? A basic income is a minimum income that is able to pay for the necessities of life such as food, clothing, and shelter; which all people receive unconditionally. Regardless of individual situation, test of any kind, or any other requirement. Part of what makes such a proposal shocking from a Conservative standpoint … is that the concept is actually the brainchild of a joint effort between the Liberals and the NDP. A 2011 report from The Dominion covers the history of the program in Canada. “Beginning in 1974, Pierre Trudeau’s Liberals and Manitoba’s first elected New Democratic Party government gave money to every person and family in Dauphin who fell below the poverty line. Under the program, called “Mincome”, about 1,000 families received monthly cheques. Unlike welfare, which only certain individuals qualified for, the guaranteed minimum income project was open to everyone. It was the first,and to this day, only,time that Canada has ever experimented with such an open-door social assistance program. For four years Dauphin was a place where anyone living below the poverty line could receive monthly cheques to boost their income, no questions asked. Single mothers could afford to put their kids through school and low-income families weren’t scrambling to pay the rent each month. Only two segments of Dauphin’s labour force worked less as a result of Mincome, new mothers and teenagers. Mothers with newborns stopped working because they wanted to stay at home longer with their babies. And teenagers worked less because they weren’t under as much pressure to support their families. Segal says the program would cost only $30 billion a year. A mere fraction of what the Canadian Government is currently spending on programs that fail at tackling the exact same issues. Clearly there is some overhead and waste in the current implementation of those programs, if one program can get the job done at far less than half of what is currently spent. By this logic, Current recipients of social assistance programs, at most are only taking in a fraction of $30 billion, as you’d have to assume at least some overhead is included in that figure. So where is the remaining 150 billion going? Not to the people that need it, that’s for sure. An International Conference dedicated to promoting this most sensible solution is being held in Montreal, QC next year. No matter how hard ‘the right’ fights to keep people poor, homeless or in their ‘private-for-profit’ prisons, This solution isn’t going away anytime soon.